The accuracy of many aerospace structures is limited by the accuracy of assembly tooling which is in turn limited by the accuracy of the measurements used to set the tooling. Further loss of accuracy results from different rates of thermal expansion for the components and tooling. This paper describes improved tooling designs and setting processes which have the potential to significantly improve the accuracy of aerospace structures. The most advanced solution described is environmentally isolated interferometer networks embedded within tooling combined with active compensation of component pick-ups. This would eliminate environmental effects on measurements while also allowing compensation for thermal expansion. 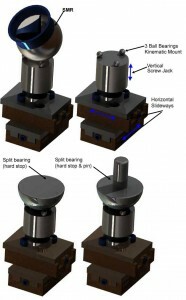 A more immediately realizable solution is the adjustment of component pick-ups using micrometer jacking screws allowing multilateration to be employed during the final stages of the setting process to generate the required offsets. BOYES, W.E., JIGS AND FIXTURES. 1980, MICHIGAN: SOCIETY OF MANUFACTURING ENGINEERS. POLLOCK, H.W., TOOL DESIGN 2ND ED. 1988, NEW JERSEY: PRENTICE HALL. FIXTURING PRINCIPLES FOR AEROSPACE STRUCTURES. INTERNATIONAL JOURNAL OF MATERIAL FORMING, 2008. COMPOSITE STRUCTURES. JOURNAL OF THE CMSC, 2010. 5(2): P. 18-25. ROOKS, B., ASSEMBLY IN AEROSPACE FEATURES AT IEE SEMINAR. ASSEMBLY AUTOMATION, 2005. 25(2): P. 108-111. FLACK, D., MEASUREMENT GOOD PRACTICE GUIDE NO. 42: CMM VERIFICATION. 2001: NATIONAL PHYSICAL LABORATORY. LEICA, PCMM SYSTEM SPECIFICATIONS: LEICA ABSOLUTE TRACKER AND LEICA T-PRODUCTS. 2008. AUTOMATED PRECISION INC, TRACKER3 LASER TRACKING SYSTEM. 2008. FARO, LASER TRACKER ION TECH SHEET. 2010. ASME, PERFORMANCE EVALUATION OF LASER-BASED SPHERICAL COORDINATE MEASUREMENT SYSTEMS, IN B89.4.19. 2006. CIDDOR, P.E., REFRACTIVE INDEX OF AIR: NEW EQUATIONS FOR THE VISIBLE AND NEAR INFRARED. APPL. OPTICS, 1996. 35: P.
MANUFACTURING TECHNOLOGY, 2002. 51(2): P. 587-609. TECHNOLOGY, 2010. 21 (2): P. 9 PAGES. MECHANICAL ENGINEERING. 2002, VIRGINIA POLYTECHNIC INSTITUTE AND STATE UNIVERSITY: BLACKSBURG. P. 226. SPECIFICATION AND VERIFICATION, IN BS EN ISO 1. 2002. PRACTICE GUIDE NO. 80 MEASUREMENT GOOD PRACTICE GUIDE. 2005: NATIONAL PHYSICAL LABORATORY NPL. HIBBELER, R.C., MECHANICS OF MATERIALS. 5TH ED. 2003, NEW JERSEY: PEARSON EDUCATION, INC.
TECHNOLOGY, 2004. 15(11): P. 2175-2187. GEOMETRIES USING FREQUENCY SCANNING INTERFEROMETRY. OPTICS AND LASERS IN ENGINEERING, 2005. 44(1): P. 79-95.